With technology evolving at its current pace, scope of the web-based learning is virtually limitless. E-Learning is an increasingly important element in learning and it provides the facility to deliver learning over the Internet or via your intranet, integrated with your tutoring, learner support and management processes. E-Learning provides exciting, new opportunities for effective training. Athena is a online learning & assessment management system to deliver quality content management with question bank and evaluation to the end users through internet or intranet in an effective way. It provides a robust platform to learn at anytime and from anywhere. 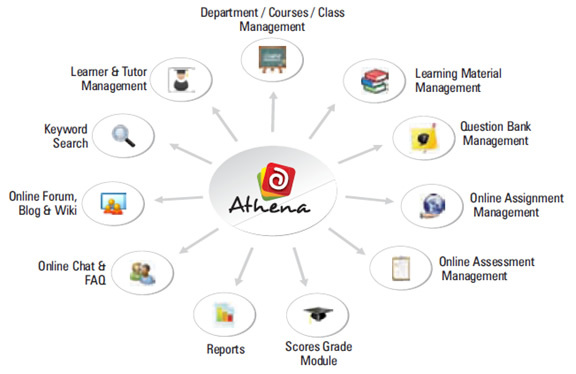 Athena provides an outstanding web-based Learning Content Management System (LCMS), using which the administrator can manage the learning contents, create assignments, training exams and perform online assessment along with evaluation & analysis. Athena enables rapid e-learning deployment and maintenance with a single point administration.